Quick update: Batman has no injuries so I am assuming Squeak banged his teeth on a bowl or something like that. Squeak enjoyed the strained mixed veggies that I gave him and last I looked in the cage his head was in the bowl of chopped up veggies so hopefully he can eat those too. I'm going to give him more baby food in a couple of hours and again at dinner and then before bed I'll give him some Critical Care. I got photos this afternoon! First, Squeak's back. 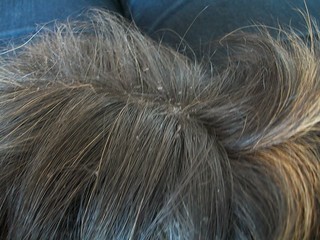 He has a LOT of dandruff and I don't know why. Nobody else has this problem. 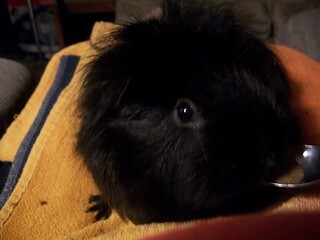 I'm thinking about giving him a bath with Gorgeous Guineas for long-haired pigs (I have some and haven't used it yet). When I was looking I saw that they are broken off close to the gum line but not actually AT the gums. That's good, right? They're kind of jagged. 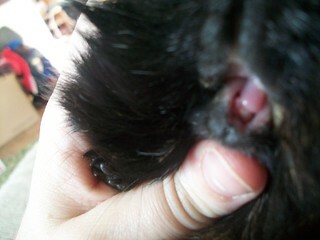 His right tooth (your left) has red in the centre, which I am guessing ISN'T good? I've read the teeth page and I know how long it will probably take for his teeth to be back to normal and all that. 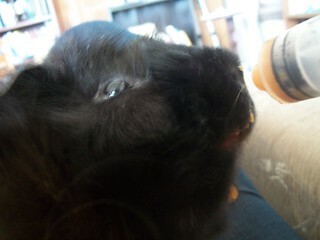 And here he is enjoying his syringe of baby food. His bottom jaw looks funny because of the lack of teeth. Perhaps give some extra vitamin C too. Glad you caught this right away. Consider also a Nizoral shampoo or some other medicated antifungal shampoo. Squeak maintained weight Tuesday-Wednesday, then lost 10g overnight so yesterday I fed him veggies (because he is now refusing Critical Care) multiple times a day. It helped and I stocked them up on fresh grass in a big way for overnight, and he gained 40g. I'm planning to take one of my syringes out to the garage and use my husband's drill to take out the inner tip since all of my larger syringes have those wide outer tips for screwing in a needle tip. Then I can go back to using a syringe to feed (the Critical Care was getting stuck in the tiny inner tip, which is fine for baby food but he won't take that anymore either). 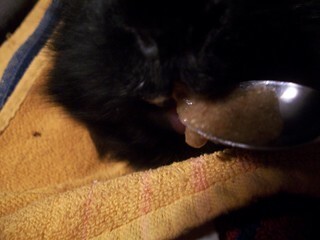 Anyway, Tuesday and Wednesday he was eating Critical Care from a spoon and I got a couple of photos. This one's my favourite, you can see his tongue! Does anyone know when I should be able to see some proper growth in his teeth? He doesn't like when I check so I'd rather save checking for when it might actually look different in there. Also, at what point will trimming of the top teeth likely be necessary? Should I wait to determine that until the bottom ones are back? When an elderly pig of mine broke a bottom tooth out, I think it took two weeks to start seeing real significant growth. It may be an individual basis issue however. One cc syringes with the restrictive tip cut off do work great for feeding Critical Care. All of my 1cc syringes have the outer thing on them too, so it would be hard to cut the tip off anyway. Just as easy to take a 20mL syringe and drill out the small tip so there's just the larger tip left. Also easier for me because I feed a lot more than 1cc at a time. Almost forgot to note that I dissolved some Vitamin C and mixed that with the Critical Care. He's also able to eat his pepper if I cut it into strips and hold it at the right angle for his back teeth to get a hold on it, so he's getting that at least. Many people do find the cut 1cc syringes work well (after being cut, the plunger can slide right out and push out anything that has be sucked in). 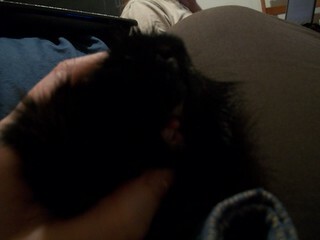 Squeak's teeth are already half-grown back, after only one week! I have no idea why this is going so quickly, but I'm definitely not complaining. I gave him some lettuce tonight and while he needed some pieces rolled into cigars and hand-fed, he mostly was able to eat it without help. There's still a sizable gap between top and bottom, as you can see, so he's not at a point yet where he'll be able to eat everything independently. I'll keep cutting his veggies into matchsticks and feeding them by hand. He can eat grass and hay on his own, though, and I saw him eating pellets last night. So my boy is well on his way to recovery! 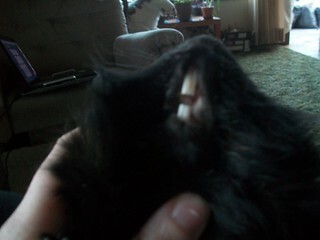 And after only two weeks, Squeak's teeth appear to have grown back completely. I compared with the others (and took photos; they weren't impressed) and this looks pretty normal. His one top tooth looks really wide but I think that's the angle of the camera. I was a little worried that the bottom ones had grown in at a weird angle, but he's eating food of all kinds just fine, including carrots. That is great! I have always been amazed at how quickly teeth grow back.